Haddock is very versatile and can be substituted in any recipe where a firm white fish is called for making haddock one of our favorite fish to use in recipes. One of our favorite ways to prepare haddock is lightly breaded, deep fried and served with tartar sauce. 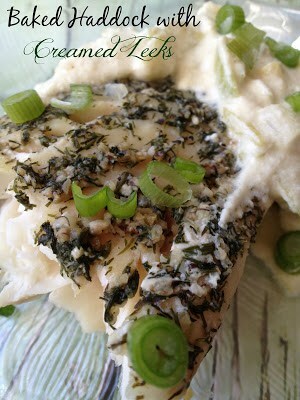 Of course, Baked Haddock with Creamed Leeks is at the top of our list of favorites. In fact, it is our favorite way to eat haddock. that’s when I usually stock up. If you do some adding, subtracting and dividing, haddock becomes a very economical dinner choice. Let’s say you have a family of four, one haddock fillet divided in half, will serve 2 people. Add a baked potato or rice, your choice of steamed vegetable, a dessert of fresh fruit with whipped topping and you have a very inexpensive and good for you dinner option. Haddock is best served as simple as possible. This allows the mild flavor of haddock to shine through. This recipe is the perfect example. Haddock fillets are lightly seasoned with dill weed and lemon-pepper seasoning then baked in a mixture of lemon juice, lemon zest, water, green onions and minced garlic. 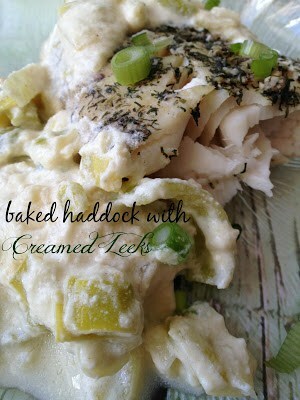 A delicious mixture of cream, leeks and Dijon mustard are whisked together then spooned over the baked haddock. 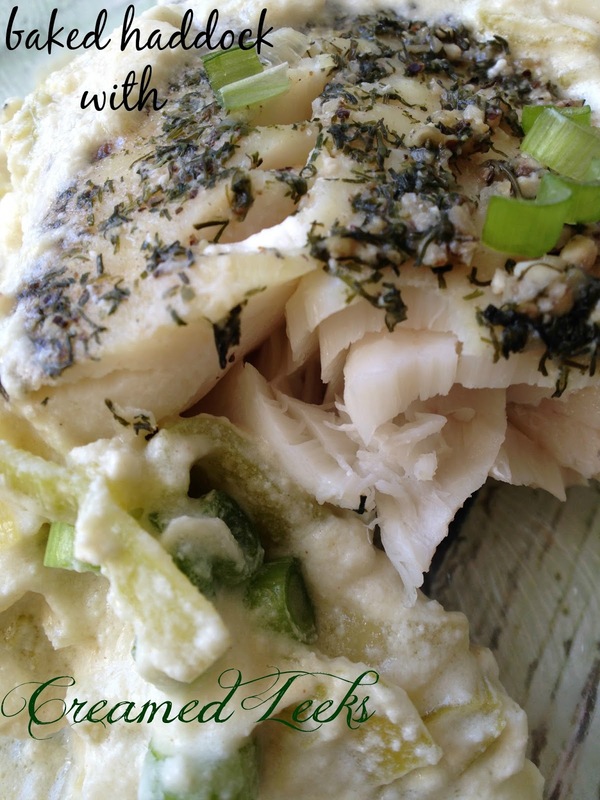 Baked haddock and creamed leeks is absolutely delicious. It is one of our favorites and I hope it becomes your family’s favorite too. If haddock or fish in general isn’t your thing, no problem. Substitute the haddock with cod or tilapia and/or any white fish you like. Grilled boneless, skinless chicken breast will work in this recipe too. You can also do what we often do, serve creamed leeks over a baked potato for a delicious ‘vegetarian’ option. Baked Haddock with Creamed Leeks is delicious served with a baked potato, a small salad or your choice of steamed vegetables. Then for dessert, you can serve a slice of angel food cake topped with macerated mixed fruit. Just reading that description is making me hungry! The combination of creamed leeks with a baked potato is my favorite way to eat haddock. Serve this delicious haddock dinner with a crisp light white wine such as a French Sauvignon Blanc. In an ungreased 11-in x 7-in x 2-in. baking dish, combine the butter, lemon juice, lemon zest, water, green onions and garlic. Add fish fillets; turn to coat. Sprinkle fillets with dill weed and lemon-pepper seasoning. Loosely cover and refrigerate for one hour. Remove from refrigerator, let stand for 10 minutes. Bake at 350º for 45 minutes. While fish is baking make creamed leeks; in a small saucepan heat oil over medium heat. Add leeks, water and salt. Cook for 8 to 10 minutes, stirring often. Turn heat to medium-high, slowly whisk in the half and half, whisking constantly. Whisk in the Dijon mustard, reduce heat to low and simmer for 5 minutes. Remove fish from oven. 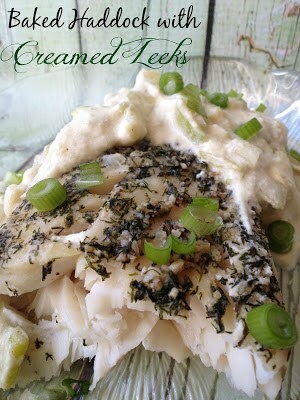 Spoon creamed leeks over fish. 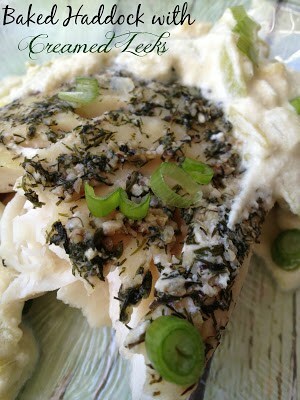 Return fish to oven and bake, uncovered, for 10 to 15 minutes longer or until fish flakes easily with a fork.